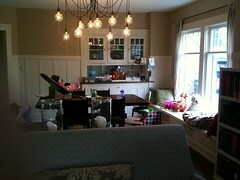 Our living room/dining room is a lot like our house in California – long and narrow. It's been a bit of a challenge to arrange our furniture in this house. Here's the room after my parents and Telfer finished scraping wallpaper and painting. We didn't document some of the process as much as we like because well, we were a bit out of sorts at this point (ahem, three-month hospital stay). The rug came with the house and basically the previous owners stained the floors AROUND the rug but not underneath the rug. So we decided to live with the rug and cover the weird floors. The rug bridged the rooms in a not-so-fluid way – it extended through the footpath from the front door to the kitchen so after a few months you could see dirty footprints on the rug. Also, a light oatmeal rug is not what I would choose with two children and a dog who throws up with the least provocation. 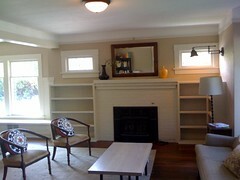 We had a wonderful guy build bookshelves around the fireplace and Telfer painted them. We are a big believer in bookshelves around fireplaces. It makes the room feel so much cozier. Telfer arranged our furniture when it arrived from New York and this is basically what the living room looked like when Jane and I finally came home. Thankfully, he left the book arranging to me. I was so worried he would start opening boxes and throwing books on the shelves. I seriously may have cried a bit over the situation. He waited. 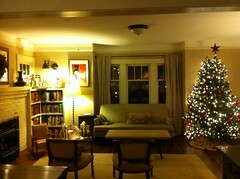 And here's the room decorated at Christmas. 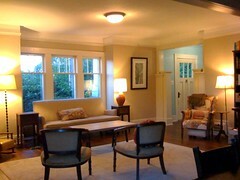 So a couple of weeks ago I was looking at living room arrangements and showed Telfer a few examples of what I liked. Within minutes we were moving around the furniture. Against the windows, the sofa blocked a lot of the light in the room. When you live in Western Washington, it's not a good idea to purposefully block out light. We are using the sofa (and a new sofa table) to divide the living room and dining room. The new rugs don't cover the floor's major imperfections but we decided we just don't care that much. The flow of the rooms is just so much better now that the floors don't even bother us a bit. The dining room table is a hub. Henry is right there on the window ledge, Cate is usually playing with her kitchen stuff right next to him and Jane is watching Cate in her bouncer. Pretty sweet. I was pretty nervous picking out a bold rug. We never purchased rugs for our house in California because of cost and I really didn't know what I liked. 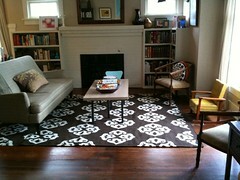 So, I am feeling pretty great about this rug from West Elm. The dining room has a really basic jute rug underneath the table. Eventually, Telfer is going to build a window seat and we'll put up sconces on either side of the wall. Sounds like another electrical project for RJ! But for now, we are so pleased with the results of our switcheroo. 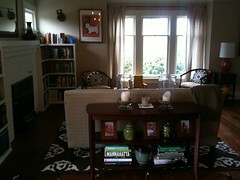 It's amazing what two rugs, a sofa table, and rearranged furniture can do for a room. What do you think? i think the former arrangement of furniture worked, too, but you definitely want every drop of light you can get, and it’s nice to be able to sit on the couch and still be facing the light. special room. special people. ho ho ho. Love it! You are so gifted at creating a special, functional space. Can’t wait to visit someday. Very Nice! 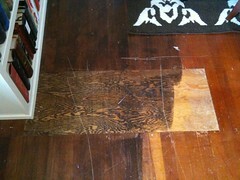 Someone didn’t even lay hardwood in that one spot – that looks like plywood! My dad told me that it was what people used to do to save money… in the 50s! Love your rug too, very nice and will probably hide the dirt and the puppy puke! I love the bookcases. I would have never known that they weren’t original to the house. It’s so common for bookcases to be on the sides of fireplaces in houses of that period. I also really love the rug. Sometimes bold is needed. 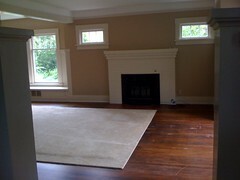 We’ve got a weird layout to our living and dining room too. It’s basically an L shape so I feel like there’s a lot of wasted space currently — we may need a bit of a re-arrange.